Rating: R for “Arrrrrrsome.” The more players you have, the more chaotic it gets. Who Will Like It? Let’s see: it’s got pirates and dice. If you like those things, you’ll probably like Pirate Dice . You sail around the seas by picking four moves from your available dice — and then everyone reveals their plans to see how things play out. Cannons fire out the sides of the ships, and damaged ships will keep cycling through certain instructions. It’s easy to see how this makes more sense as a robot programming game than pirate ships, but I suppose you could argue that it takes time for a captain to issue instructions to his crew, and you can’t turn a ship around on a dime. The programming aspect aside, though, it fits really well — your ships get shoved around by other ships (and take damage from them), you fire cannons from the sides, you run aground on reefs and get pushed around by tide currents and spun by whirlpools. The rulebook is actually fairly entertaining, with lots of silly nautical jokes in the footnotes. I backed the game on Kickstarter myself, so I got a bunch of extras, like the Pirate Ship die and 8 additional map tiles. I also paid extra for the 5th player expansion (the orange dice). The dice are painted chunky wooden dice, larger than your average six-sided dice, with the various icons printed on them. The ship die shows the pirate ship and is numbered 1 to 6, showing the ship’s health. 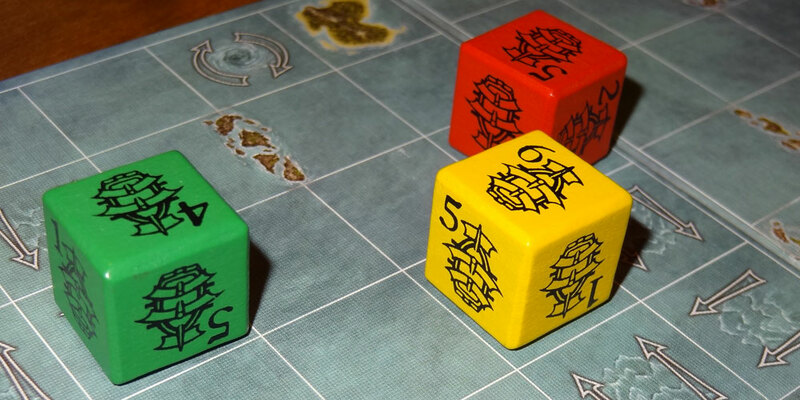 The command dice have various control icons on them: move forward or backward, drift or turn left or right, U-turn, and some extra icons for skullduggery. The map tiles and player mats are 5″ square with a linen finish. The player screens (see below) are cardstock that you fold and stand up in front of you. The center section of the screen isn’t quite wide enough to go across the player mat, so I always feel like it’s not quite the right size. There’s a handy player reference printed on the inside of the screen, though you won’t need it for long because the icons are easily learned. The box insert is perfectly sized for the bits — there’s room at the bottom for the dice, including an extra space for the 5th player expansion (although then you’ll want something to put the cardboard punch-out tokens in). It holds all the map tiles and player mats with some room to spare, and the screens go across the top. The only thing, as you can see, is that there is a good deal of wasted space on, but I suppose Gryphon Games wanted to avoid a long, narrow box. There are a bunch of different variants, but I’ll start with the basic game. The object is to be the first one to land your ship on the treasure. 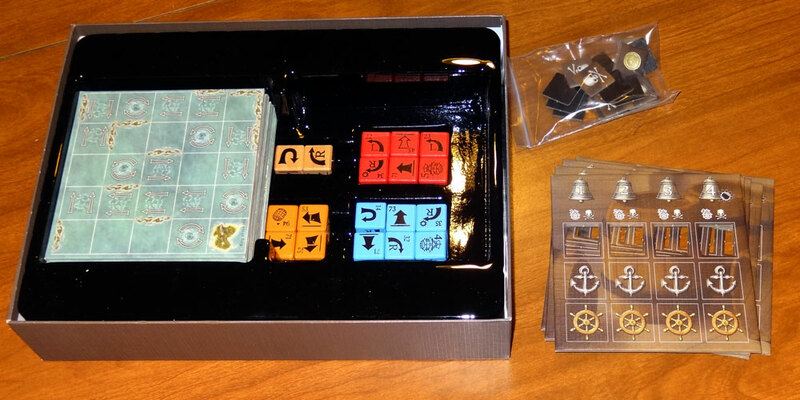 Each player starts with their 5 command dice and 1 ship die, a player mat, and a player screen. 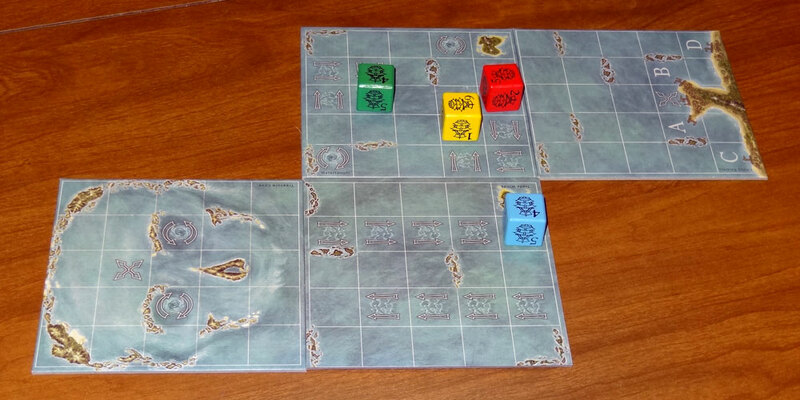 For the standard game, you use three map tiles: the Starting Shoals, the Treasure Cove, and one other one. They should be arranged in an “L” shape, with the shoreline on one end of the map and the “X” for the treasure at the other end. Additional tiles can be used to make a longer map for a longer game, but even just the three-tile map can be quite challenging. Players roll-off with their ship dice to see who goes first. In descending order, players choose one of the letters on Starting Shoals to place their ships, facing in any direction they choose. Each ship is placed with the “6” side showing, indicating there is no damage. Now the fun begins! 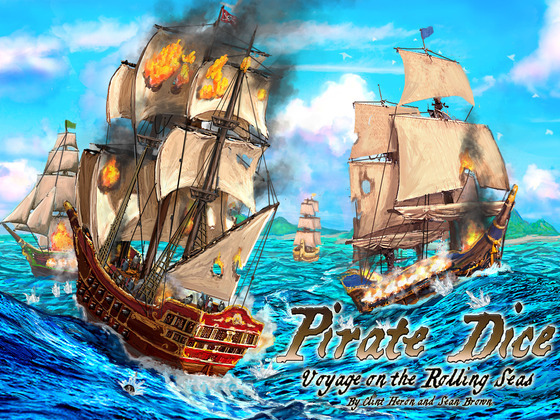 Each round has three phases: roll & place dice, move ships, and cannonfire. Roll and place: Everyone rolls their dice in secret. You must eventually place one die in each of the four columns on your player mat, representing the four “bells” of the round. You have to place at least one die somewhere before you can re-roll, and once a die has been placed it cannot be moved until the round is over. When you re-roll, you have to re-roll all of the remaining unplaced dice. Dice placed on the Ship’s Wheel will execute a command. Dice placed on the Anchor are ignored. The holes in the player mat are for “locked” dice, which happens when you take too much damage. Move ships: After everyone has four dice placed, you remove the screens and reveal your commands. Starting with the first bell, all players announce the number shown on their dice. 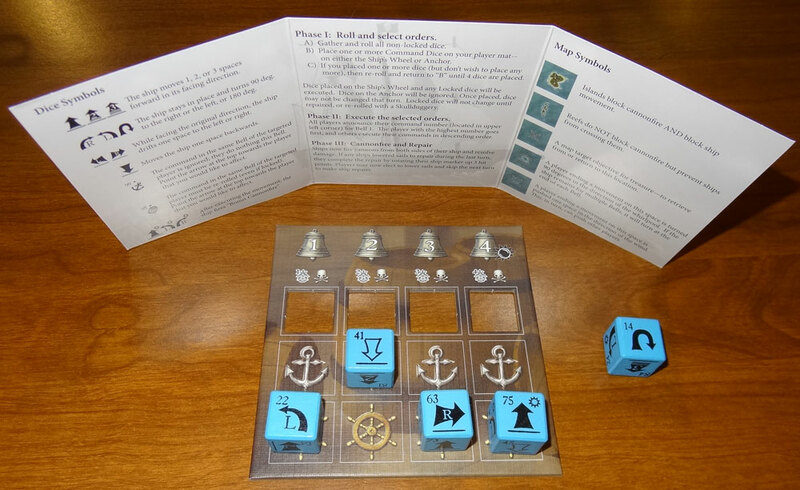 The commands will resolve in descending order, and each player with a die on their Ship’s Wheel will execute their commands, moving their ships around. If you run into another ship you will just push it ahead of you, but ships cannot pass through reefs, islands, or off the edge of the map. Once everyone has executed their commands for the bell, then the map effects are resolved: whirlpools turn ships 90 degrees, and wind pushes a ship one space in the direction shown. Cannonfire: At the end of the fourth bell, all ships fire from both sides of their ships simultaneously. Cannonballs travel in a straight line until they hit something: a ship, a map edge, an island. (They go through reefs.) If your ship is hit, it takes one point of damage and you rotate your ship die to reflect the amount of damage done. Then the screens go back up, and you repeat the process until somebody ends a bell on the treasure space. Of course, it’s not always that simple, because when your ship gets damaged things start to go haywire. Oh, and there’s the skullduggery. Aside from the end-of-round cannonfire, some of the dice also give you bonus cannonfire, shooting once after you execute the move. And if you ram into somebody (moving at 2 or 3 speed) then you also do one point of damage. The first point of damage (bringing you to 5 points) doesn’t affect your ship’s commands. But if you drop to 4 points, then your fourth die is now locked — you move it to the hole in the player mat for the fourth bell, showing whatever face was already there. For each additional point of damage you take, you’ll lock another die. (When you’re down to 1 hit point, all four of your dice will be locked.) Locked dice execute just like they were on the Ship’s Wheel — but you don’t get to re-roll them or move them. And, of course, if you run out of hit points, your ship sinks and you remove your ship from the map. But don’t worry — you’ve got a few ships in reserve. You get to place a new ship (with only 5 hit points) somewhere on the map tile closer to home than where you sank. If you want to attempt repairs, you can also lower your sails for a turn — put your screen over your player mat, and announce that you’re repairing your ship. You will take no actions this round (although you can still get affected by other players and map effects). If you survive the round, you get to repair 3 hit points, which will also unlock a few dice. Finally, what’s a pirate game without a bit of skullduggery? There are two icons on the dice that let you interfere with other players. Each one has an arrow on it, which you point at the player you’d like to affect. The Anchor forces the target player to put their die onto the Anchor instead of the Ship’s Wheel, so that command doesn’t execute as planned. The Rum Barrel forces the player to re-roll the die and accept the result, whatever it is. You can also protect yourself by pointing the arrow at yourself — it gives you one hit point, and protects you from any further skullduggery for the rest of the round. There are several variants included in the rules. Among them is “Return the Treasure,” in which you must get to the treasure and then get back to the “X” on the Starting Shoals. When you have the treasure, you also get the treasure die, which can be used for commands. It includes a Reverse 2 command, as well as a Fire Cannon (without moving) command. You can also play the Cannonball Regatta, which involves using four tiles in a square — be the first to make a lap around the bay to win. The Ghost Ship expansion adds the black ship die, which appears when somebody has the treasure. It now sails around based on the anchored dice of all the players, and is immune to cannons and map effects. It causes damage (from terror) whenever it occupies the same space as your ship. I’ve only played a handful of games that involve this sort of “programming” mechanic, where you pick several moves in advance and then have to see how they play out: Wings of War and the X-Wing Miniatures game take this approach, as does the Kickstarter-funded Kings of Air and Steam . The biggest difference with Pirate Dice , though, is that your selection is limited to what you can manage to roll with the dice, adding another element of chance to the game. In the game, though, that translates to chaos and hilarity, as you and your opponents circle each other or run into reefs because things didn’t go exactly as planned. The game is fairly easy to teach. There’s sometimes a little confusing about the skullduggery and locked dice, but overall I found it was pretty easy to teach even younger kids. My older daughter has really taken to it, and on our Christmas vacation she even took it and taught one of her friends to play it without my assistance. The game works fine as a two-player game, but I’ve found it’s especially fun when you throw in lots of players and have everyone interfering with each other. Of course, this can also lengthen the game significantly. I played one game where one player was within two spaces of the treasure for several rounds because she kept getting rammed, shot at, or turned around in a whirlpool. The raft of variants means that if you get bored with the basic game (I haven’t yet) you can try something new. I highly recommend picking up the 5th player expansion. It’s not listed on the Gryphon Games site yet, but hopefully will be available soon. There really isn’t much to complain about, actually. I’m glad I got in on the Kickstarter, but even without all the extras it’s still a fine addition to your game closet. If you like to be able to plan out a long-term strategy, you’ll probably get frustrated by the wackiness and skullduggery. But for pirates who can handle a bit of mayhem, Pirate Dice is a fantastic voyage. Wired: Excellent components with good box insert. Lots of hilarity when programming goes awry. Plenty of variants to adjust difficulty and length of game. Tired: Box is a little bigger than really necessary. No actual rum included.